The diagram of the stomach with relevant captions will explain how and why horses develop and some of the changes that occur when we digress too far away from what nature intended. 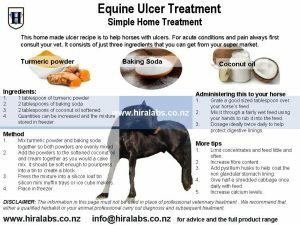 A simple home made recipe to help with the symptoms and treatment of ulcers. Remember this is a remedy and should be discontinued as soon as the condition is resolved. Ulcers occur when acid in the digestive tract eats away at the inner surface of the alimentary canal, stomach or small intestine and becomes inflamed and painful. The acid can create a painful open sore that may bleed. As the sore is exposed to more acid it becomes more pitted. The horse’s digestive tract is coated with a mucous layer that normally protects against acid. But if the amount of acid is increased or the amount of mucus is decreased, an ulcer can occur. Fasting and or Intermittent Feeding unlike what occurs in nature – Horses evolved to graze, eating many small meals frequently which means the stomach is rarely empty and the stomach acid has less of a damaging effect. Too little Roughage percentage in feed and type of roughage play a role in ulcer development. Roughage, because it requires more chewing, stimulates the production of more saliva. The swallowed saliva helps to neutralize stomach acid. The type of roughage is also important. It must include soluble and insoluble fibre. Some plants have a percentage of soluble fibre in the cellulose that is mucilaginous. This substance will help line the alimentary canal. Insufficient Calcium in the Diet: Alfalfa is higher in calcium, and it is thought that this may help decrease the risk of ulcers. There are herbs and plants that are calcium accumulators. These may provide the biologically calcium required. Insufficient Magnesium: This is indicated by a horse tending to be on high alert with its head up and reactive. Such horses are prone to ulcers. Too many concentrates There is an increase in acid production when concentrates are fed. Amount of exercise: As the amount of exercise increases, there is often a change in feeding which increases the risk of ulcer development. Exercise may increase the time it takes for the stomach to empty, so large amounts of acid can remain in an empty stomach for a prolonged period of time. Stress and excess cortisol: may decrease the amount of blood flow to the stomach, which makes the lining of the stomach more vulnerable to injury from stomach acid. Insufficient grazing time: Horses must spend a good deal of time with their heads at grass level to keep them relaxed and to prevent an over production of adrenaline. Medications – Chronic use of non-steroidal anti-inflammatory drugs (NSAIDS) such as phenylbutazone (Bute) and flunixin meglumine (Banamine) blocks the production of a particular chemical called PgE2. (Prostaglandin E2)a PgE2 decreases acid production, so when PgE2 levels are low, acid levels are high, contributing to the development of ulcers. Weight Loss: Dependent on the severity and duration of the ulcers. However, even in less severe cases horses are poor condition, indicating that it is hard to keep weight on them. Loss of muscle mass: Particularly along the top line coupled with poor body condition. Eating Patterns: The horse may have become a slow or picky eater. Some will literally walk away from their hay and/or grain. It is common that they may nibble hay, but refuse grain. 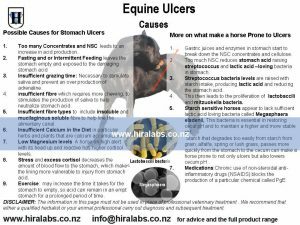 Some horses with ulcers will continue to eat well but not maintain condition. 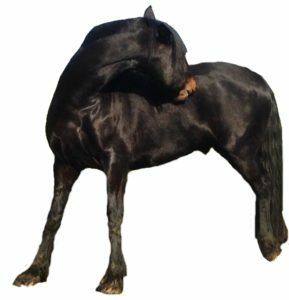 Appearance: Changes to the hair coat, especially, over the thorax (chest) is duller than on the neck or hindquarters can occur on the majority but not all horses with ulcers. Resistance to Grooming: Many horses with ulcers do not like to be brushed on the bottom of the chest and abdomen. Some kick out if touched in the area of the sheath or mammary glands. Poor digestion: Toxins released from altered gut flora affect digestion and increase a risk of laminitis/founder. These horses are hard keepers. Poor hoof quality: Often brittle uneven growth due to poor nutrient absorption. Ridges may appear on the horn. Changes in ridden behaviour:The nature and type of evasions are indicative of discomfort. The horse may respond by becoming more resistant to going forward. It may kick out, rear or buck when asked to go forward or reluctant to jump, running out, bucking or refusals. Similarly horses may be reluctant to go down hill (including the horse landing after a jump), when the stomach has been compressed by the abdominal contents, the acids in the stomach are splashed up and onto the non-glandular portion. This portion of the stomach is more susceptible to acid damage than the secretary glandular portion. General irritability: by becoming more irritable in general, but specifically to being groomed or handled. Some progress to the point of being aggressive. Chronic cases “turn inward” and appear dull and disinterested . Signs of Pain through Performance changes : Body pain goes hand in with ulcers. Whether arising from muscles, chiropractic problems or from joints, this persistent pain is associated with impaired performance. Due to the consistent muscle pain patterns found in ulcer cases, the horse will refuse to pick up a specific lead and do not come through in the hindquarters (especially the right hind). Loss of joint motion results in pain and inability to use the back well. 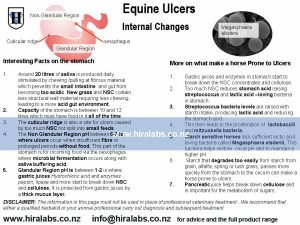 Medications and changes in management practices are the basis of therapy for equine gastric ulcers. Medications are used for three purposes: (1) to decrease acid production, (2) to buffer the acid that is produced, and (3) to protect the lining of the stomach from the effects of the acid. H2 blockers: These are medications that block the action of histamine. Histamine stimulates the production of stomach acid. Example: Cimetidine, ranitidine. Buffers: Antacids buffer the action of the stomach acid. Because acid is constantly being produced in the horse, antacids are effective for only a short time (less than an hour) and require large amounts be given. Protectants: Certain drugs can block acid from coming into contact with the stomach lining. Unfortunately, these do not appear to be as effective in the oesophageal portion of the stomach. Example: Sucralfate. Antacids Etc The use of alkalis or the so-called antacids in the gastric hyperacidity syndrome is accepted practice. The alkalis are used for the purpose of giving relief from the pain, and to promote healing of the ulcer. The most popular remedy of this type at the present time is sodium bicarbonate. Carbonate powders is made up of two powder mixes (a) in equal quantities magnesium oxide and sodium bicarbonate, (b) to be used alternately with (a) (10 grains) of calciums carbonate to (20 to 30 grains) of sodium bicarbonate. Antibiotics treat bacteria in the ulcer bed that can inhibit healing. While not used in every case, antibiotics can be helpful if gastric ulcers are taking longer than normal to heal because the ulcers are inflamed from bacterial infection. Sucralfate, a complex of aluminum and sugar, adheres to ulcers to coat and protect the site of ulcers. Make sure that your horse gets little and often. Food should be taken in from ground level. This ensures the adrenals are not activated. Continual access to food, pasture, bark, high fibre diet. Do not yard for extended period of time. This causes stress and a rise in cortisol predisposing the horse to ulcers. Modify the horse’s pasture to ensure that the horse is not exposed to high fructan levels. Ensure that the diet is weighted towards high fibre and avoid NSC (non specific carbohydrates) and all processed feeds. Chamomile extract this will act on the parasympathetic system which is responsible for stimulation of “rest-and-digest” or “feed and breed”activities that occur when the body is at rest, especially after eating, including salivation, urination, digestion and elimination. Its action is described as being complementary to that of the sympathetic nervous system, which is responsible for stimulating activities associated with the fight-or-flight response. 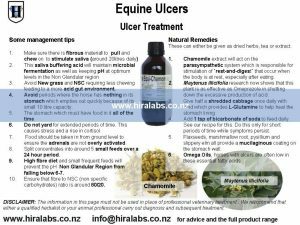 Omega Oils Often horses with ulcers are low in essential fatty acids. These coat each cell with a protective lipid layer which helps with the absorption of nutrients. Flax seeds and chia seed simple and commonly used method is to add freshly ground flax seed to the feed. This helps to supply Omega 3 fatty acids, which can help with weight management while the hindgut is compromised and may promote healing. It also provides a thick gel that will help sooth the stomach wall. Psyllium Husks. ( similar action to flaxseeds) This is a natural soluble dietary fibre that works as a bulk laxative. It is used particularly to help remove ingested sand from the colon, which may cause ulcers (through the abrasive effects of the sand particles) or lead to sand colic. It also provides a mucilaginous coat to line the stomach wall. Add 2-3 tablespoons of husks to a cup of hot water stir vigorously and add to feed. Lucerne Chaff this has higher levels of calcium than other feeds. This may be used to feed as part of the feed regime. Slippery Elm powder Add 1 tablespoon to warm water and add to feed. Marshmallow root this will also provide a coating to the mucus layer. Licorice root extract Anti-ulcer herb which reduces inflammation in the stomach. *Should not be used long-term though as it can lower gastric secretions. Licorice has anti-bacterial activity so it is beneficial for digestive upsets secondary to pathogenic bacteria. It also has anti-fungal activity against such pathogens as candida albicans, which can overgrow and disrupt the delicate balance of bacteria in the intestine. Licorice also has an anti-inflammatory property similar in strength to steroids so it can be very effective for bowel inflammation but it should be discontinued as soon as the condition is resolved. Aloe Vera is classified as a mucilaginous and bitter herb. It is beneficial for the skin, stomach, and colon. Aloe’s major properties are as a cell proliferant, healer, demulcent (soothing agent), and allergy reducer. It is high in digestible fiber, which gives it the properties of lowering bowel transit time, absorbing toxins in the bowel, regulating colonic bacteria, and soothing and protecting the digestive tract. Aloe also contains a complex mixture of mucopolysaccharides (complex sugars) that nourish cells and support them in replicating. This property is especially important for the healing of pre-existing ulcers. The polysaccharides also have an antibiotic action, which can be helpful for horses who have been on buffering agents or other medications that destroy healthy bacterial populations in the gut and allow pathogenic bacteria to multiply. Echinacea should be given to strengthen the immune system and improve general health. Give 3ml the extract three times a day for three weeks and then discontinue for a week before administering it again. Meadow Sweet (this is a mild anti-inflammatory with similar phyto chemicals to white willow bark. Pro and Pre biotics will help restore gut flora. DISCLAIMER: Hira Laboratories will not be held responsible for the use or misuse of any products or information provided on this page . We ALWAYS recommend that either a qualified herbalist or your animal professional carry out diagnosis and subsequent treatment. Herbal remedies must not be given not be taken in conjunction with other medication with out consulting a medical professional.